Jerky is one of the mysteries of life: Overcook a slab of beef, for example, and the texture toughens, the natural juices disappear, and chewing becomes a grim exercise. But slice the same beef into thin strips and expose it to low dry heat for several hours, and you’ve created the greater-than-the-sum-of-its-parts delicacy known as jerky. Today, jerky is a popular and egalitarian snack, sold at high-end specialty food retailers and gas stations alike. Americans consume over 2 million pounds of it annually—most of it commercially produced. 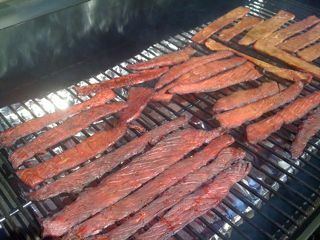 But jerky is very easy to make at home if you have a smoker or charcoal grill and a bit of patience. Here are some general guidelines, followed by two recipes to get you started. Use lean cuts of meat with very little intramuscular fat or connective tissue, such as top or bottom round. Slice the meat into 1/4- to 3/8-inch slices. This is easier if the meat is partially frozen first. Alternatively, ask your butcher to do it for you on his meat slicer. For the best texture, slice beef against the grain and fish and poultry with the grain. Beef jerky is far and away the most popular type of jerky in this country, but you can turn many other wild and domestic meats into jerky. If you are a hunter, know that most big and small game species make great jerky: venison, moose, mule deer, antelope, elk, rabbit, and bison—to name a few. Smoking and drying require low temperatures, which you can achieve by using just a few coals or chunks of hardwood. If making turkey or chicken jerky, be sure to cook to 165°F either before or after smoking. For safety reasons, pork is not generally used to make jerky. You can smoke the jerky, if desired, and then finish it in a counter-top dehydrator, a convection oven, or a conventional oven set on its lowest temperature, the door propped open a half-inch with the handle of a wooden spoon. Store jerky in resealable plastic bags or lidded jars. Refrigerate for the longest shelf life. You’ll also need: 4 to 6 cups of wood chips, preferably oak, soaked in cold water for an hour, then drained. Make the marinade: In a mixing bowl, combine the soy sauce, water, Worcestershire sauce, curing salt (if using), barbecue rub, and pepper and whisk to mix. With a sharp knife, slice the beef into 1/4-inch thick slices against the grain. (This is easier if the meat is partially frozen.) Trim off any fat or connective tissue. Put the beef slices in a large resealable plastic bag. Pour the marinade over the beef, and massage the bag so that all the slices get coated with the marinade. Seal the bag and refrigerate for several hours, or overnight. Set up your grill or smoker for indirect grilling and preheat to low (180°F or less). If using a charcoal grill, put 1 cup of chips on the coals. Remove the beef from the marinade and discard the marinade. Dry the beef slices between paper towels. Arrange the meat in a single layer directly on the grill grate. Smoke for 4 to 5 hours, or until the jerky is dry but still chewy and somewhat pliant when you bend a piece. Replenish the smoking chips as needed. Transfer the jerky to a resealable plastic bag while it’s still warm. Let the jerky rest for an hour at room temperature. Squeeze any air from the bag, and refrigerate the jerky. It will keep for several weeks. Note: Morton’s Tender Quick® is a commercial curing mixture—a blend of sodium with small parts of sodium nitrate and nitrite. It will give the jerky a translucent look and tenderer chew. You can substitute Prague powder (also called “pink salt”), but be sure to follow package directions carefully as less than 1/2 teaspoon is enough to cure 2 pounds of meat. You’ll also need: 4 to 6 cups of wood chips, preferably alder, soaked in cold water for an hour, then drained. Make the marinade: In a small mixing bowl, combine the soy sauce, 1/4 cup of maple syrup, brown sugar, lemon juice, and pepper and whisk to mix. Make the glaze: Combine the remaining 1/4 cup of maple syrup with 2 tablespoons of warm water. Set aside. With a sharp knife, slice the salmon into 1/4-inch thick slices with the grain. (This is easier if the fish is partially frozen.) Put the salmon slices in a large resealable plastic bag. Pour the soy sauce mixture over the salmon, and massage the bag so that all the slices get coated with the marinade. Seal the bag and refrigerate for 2 to 3 hours. Remove the salmon from the marinade and discard the marinade. Dry the salmon slices between paper towels. Arrange the meat in a single layer directly on the grill grate. Smoke for 4 to 5 hours, or until the jerky is dry but still chewy and somewhat pliant when you bend a piece. Brush 2 or 3 times with the glaze after the first 3 hours. Replenish the smoking chips as needed. Let the jerky rest, uncovered, for an hour at room temperature. Transfer the jerky to a resealable plastic bag. Squeeze any air from the bag, and refrigerate the jerky. It will keep for several days.